This is, as far as I’m concerned, a nothing image. The content is uninteresting, the execution is poor (the relative sizes of the different elements are all out of whack and look like dodgy photoshop layers) and its got a crap ‘pirate’ typeface slapped on the top. If you look on Baldwin’s website pretty much everything on there is better than this. A traditional science fiction cover and my response to traditional SF covers is much the same as this. You wouldn’t catch me reading this on the train. We have explosions, we have a fancy spacesuit, we have a lot of lazers and even more orange. 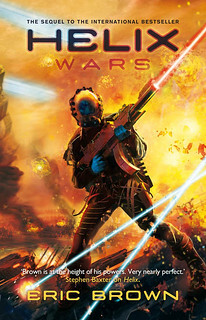 I also can’t help but notice that our stalwart hero is looking directly at the reader whilst rather caverlierly firing his gun at something out of his (and our) line of sight. And why does a laser rifle need a massive banana clip? Appropriately, this is worldbuilding every bit as shoddy as you’d find in a Brown novel. A good match for the novel which takes place on a planet without sun is therefore illuminated only by bioluminence from its flora and fauna. The specific image of the insect is then embellished with abstract whorls which make the whole thing appear uncanny and disquieting. 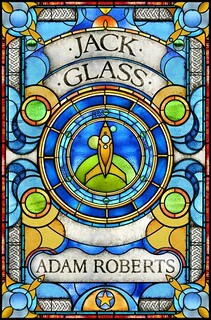 An inspired idea to translate the iconography of science fiction into the iconography of Christianity. 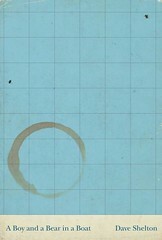 I’ve no idea if there is any relevence to this beyond the title of the novel but it works perfectly. Joey Hifi is, simply put, the best cover artist currently working in SF (Hugo nominators, take note). His work for Lauren Beukes and Chuck Wendig has been outstanding and this cover doesn’t disappointing. He layers two simple images – the radiation symbol and an atomic explosion itself – over other and then sketches the results of these into the image itself. 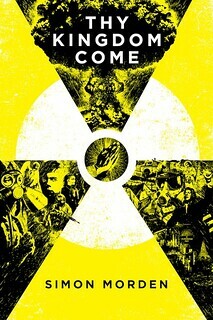 I particularly like the little details where the rifle and the mushroom cloud break the line of the symbol. Nice placement of title and author too. This makes an interesting link to the Inky Tentacle since, due to the relationship between Jurassic London and the Kitshies, Hifi’s cover is ineligible. This is a shame and makes me doubly keen for it to win the BSFA Award. In contrast tot hat award, the Inky is a juried award which this year was judged by Gary Northfield, Lauren O’Farrell and Ed Warren. They are all professionals so you would imagine it to be judged to different criteria than those used by the members of the BSFA but I was still surprised that there was no overlap. I had thought the Blacksheep cover for Jack Glass might make it. I’d like to start by discussing two images: Peter Mendelsund’s cover for Flame Alphabet by Ben Marcus (Granta) and Dave Shelton’s cover for his own A Boy And A Bear In A Boat. Both are bold images that lack any genre reference point. The cover for The Flame Alphabet, in particular, fits very neatly into contemporary literary fiction design and conveys little about its contents. The novel itself is obviously science fiction so the cover is equally obviously eligible but is this enough? A Boy And His Bear In A Boot is less abstract – a clever joke, in fact – but the same applies. Well, if it is good enough for the judges. 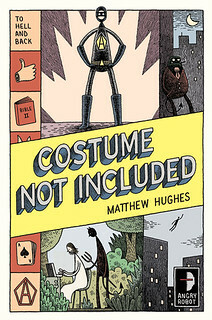 Next we have two of my favourite cartoonists: Tom Gauld’s cover for Costume Not Included by Matthew Hughes and Oliver Jeffers’s cover the Terrible thing That Happened To Barnaby Brocket by John Boyne. Gaunt is just Gaunt which is to say marvellous. God on his laptop is a classic Gaunt touch and I love the reptillian hood smoking a fag at top right. Just a shame it has to have the Angry Robot logo (even re-drawn) on the front. Unfortunately, whilst I am a fan of Jeffers’s own work, this image does nothing for me. 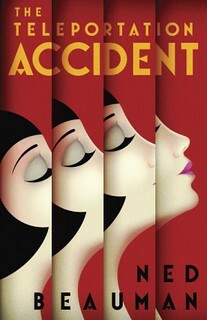 Which leaves La Boca’s cover for The Teleportation Accident by Ned Beauman. This has really grown on me. As with Thy Kingdon Come, the designer has taken a classic image (in this case the famous Lousie Brooks profile) and repurposed it. By simply stuttering the image, La Boca manages to evoke the setting, genre and tone of the novel whilst creating a memorable cover that stands on its own feet. This is my undoubted winner and I suspect the judges will agree with me. Rash, I know. My personal shortlist for a combined award would have been Si Scott, Blacksheep, Joef Hifi, Tom Gaunt and La Boca. But what were the deserving covers that were missed off both shortlists? My problem with Ben Baldwin is that all of his artwork looks identical: Grainy washed-out texture, single-point perspective, shadowy figure in the foreground. I like Baldwin’s Interzone covers much more than Dark Currents, and even if I liked the painting more I think the fonts and text layout would sink it for me. For the Kitschies I think my taste just runs in a different direction, so I’m not that keen on either the cartoons or the more stylized literary covers of the other two, but I do like the La Boca a lot. 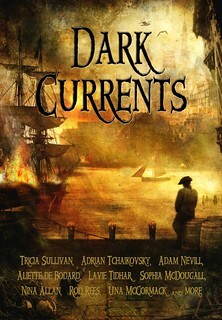 That Dark Currents cover picture is terrible. The main focal point of the picture is a big, blank nothing, the title text covers up the only part of the picture that offers variety and visual interest, but the flaming ship is weirdly off-centre and the colours used have a disappointing lack of variety. There are so many levels it fails on that I’m surprised it got anywhere near the shortlist at all. 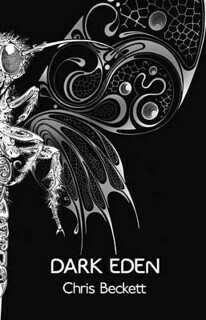 Do like the Dark Eden and Jack Glass covers, but have to agree with everything you say about Joey Hifi. His covers for Wendig’s books have been especially good and counted in no small way towards me picking them up. The Kitschie covers are a much more interesting selection. 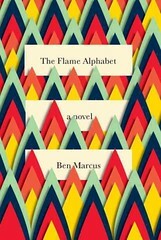 The Flame Alphabet was instantly recognisable to me as being a Mendelsund cover, that sort of minimalism and style is classic Mendelsund, and like with most of his covers he manages to do it without delivering a boring cover – the way the flames overlap adds interest and makes the cover ‘pop’ much more. This in contrast to the cover for A Boy And His Bear In A Boot , where although I can see what Shelton was trying for, it doesn’t really work for me and just looks boring. 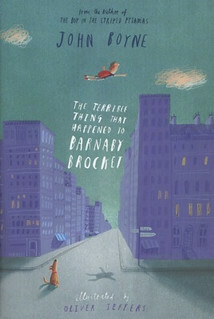 Similarly the cover for The Terrible thing That Happened To Barnaby Brocket falls into the same trap for me, in this case it is nicely drawn, but there’s nothing special about it to my eye. Gauld can do little wrong, and I like his cover for Costume Not Included , though it’s not quite as good as his cover for The Damned Busters – that had a little more spark about it, while this is more carrying on a formula. I’m also slightly bothered by the way the title goes across the whole front this time, so partially covering up some of the small squares going down the left side. Love the cover for The Teleportation Accident , can’t say anything about it you haven’t already said. It’s just pretty much perfect in every way. Interesting and well-put critiques. I can’t say much more as I have to remain impartial, but I enjoyed reading this. I personally love the mood, colors and evocative nature Dark Currents but I’m surprised that none of Ben Baldwin’s Interzone covers were shortlisted. I was hoping to see La Boca win this one and was disappointed to see A Boy and His Bear win as it was my least favorite of the nominees.